INOX Leisure Ltd (INOX), India's fastest growing multiplex chain, has today launched its second multiplex in the city of Lucknow at the Gardens Galleria Mall. The latest multiplex from INOX comprises of 4 screens and a total seating capacity of 803 seats. INOX is already operating a 4 screen multiplex at Riverside Mall, Lucknow. With this launch, INOX will have a total of 8 multiplexes with 31 screens in the state of Uttar Pradesh. Equipped with advanced cinema technologies, the multiplex has an advanced digital projection system for razor sharp visuals, digital sound powered by Dolby and vibrant 3D powered screen by Volfoni Systems. The multiplex has been designed as an exclusive destination for the modern movie patrons of Lucknow, oozing with a stylized contemporary feel. The combination of sharp interiors and a choice of chic colors will leave a lasting appeal in the minds of the movie-goers. The use of charcoal dual paint is unique and combines well with the backlit walls, amplifying the glamour quotient. The multiplex will boast of a string of customer-friendly features like vibrant interiors and attractive food options. Commenting on the launch, Mr. Lalit Ojha, Regional Director - North, INOX Leisure Ltd, says, "Having witnessed the love and patronage of our guests at our 1st multiplex in Lucknow, we feel proud and delighted as we open our doors to welcome the movie lovers to yet another multiplex in this city with rich cinematic legacy. We are sure that our top class hospitality, design and technology will combine well to delight our patrons and strengthen our bonding with them." With this launch, INOX will expand its presence to 140 multiplexes spanning 578 screens across 67 cities in the country. INOX Leisure Limited (INOX) is amongst India's largest multiplex chains with 140 multiplexes and 578 screens in 67 cities. INOX has redefined movie experiences in India making it truly a 7-star experience. Each INOX property is unique with its own distinct architecture and aesthetics. Beyond the normal screens, INOX also has INOX INSIGNIA for the discerning audience, KIDDLES for young patrons and MX4D® EFX Theatre for an immersive experience at select locations. INOX brings the very latest in projection and audio technology with INOX Laserplex, IMAX & INOX ONYX. Some of the key multiplex features include plush micro adjustable leather recliners with a butler on call facility, gourmet meal choices by celebrity chef, designer staff uniforms. 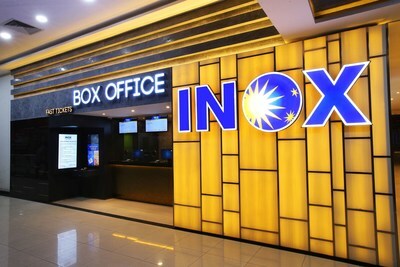 For easy and convenient ticket booking, INOX offers online booking on http://www.inoxmovies.com and through its smart phone applications across Android and Apple platforms.